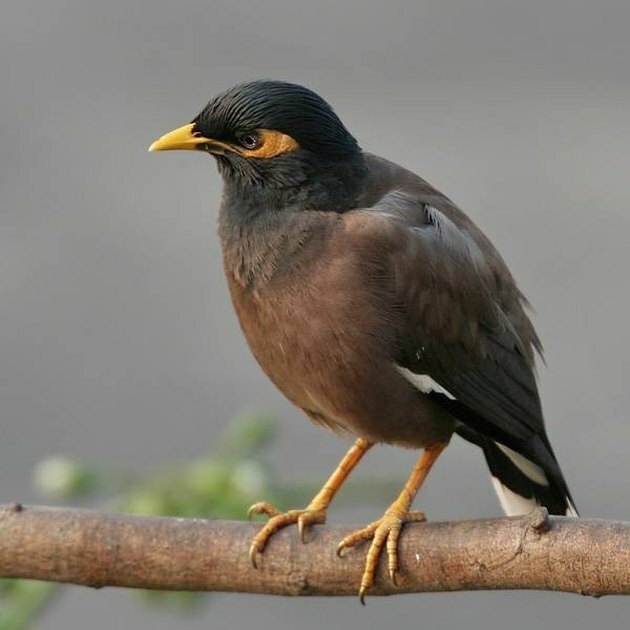 The mynah bird is a member of the starling family. A native of Southeast Asia, the mynah has migrated and can now be found all over the world. The species is commonly thought of as invasive as it fights aggressively with native wildlife. It destroys the eggs and fledglings of other birds, reducing the overall biodiversity of any given area. It is hostile not just to other birds but to small mammals such as squirrels and possums. It also inflicts damage to crops, generates huge amounts of noise and has been known to spread diseases among other animals and even to people. If you have mynah birds and you'd like to get rid of them, follow the steps in the guide below. Limit the available sources of food. If you see mynah birds in your yard, immediately remove any bird feeders and stop leaving bird seed out. Additionally, you should begin feeding your pets inside as mynahs are opportunistic and will make use of almost any available source of nutrition. If you keep chickens or other domestic birds, ensure they are fed in an enclosed area that is inaccessible to mynahs. When feeding any other livestock, be sure to sweep up any grain spills immediately and remove any uneaten food. Reduce the available nesting sites. Mynahs like to build their nests inside tree hollows, gaps in roofing, cavities in eaves, and depressions found in overgrown shrubbery. You can decrease the attractive nesting sites in your yard by keeping your trees and shrubs well trimmed and by filling in any holes in your woodwork. Also, you can line the edges of your roof and your windowsills with spikes so the birds are unable to roost there. Remove any existing bird nests. Be sure to wear a long-sleeved shirt, hat, face mask and protective gloves. Mynah birds often carry mites that can cause relentless itching and red, irritated rashes if you come into contact with them. Once the nest has been removed, place it into a plastic garbage bag, tie the bag shut and immediately remove the nest from your property. Make your home and yard as uninviting as possible. Use a combination of anti-bird-friendly techniques such as hanging pie tins from trees, spraying shrubs and foliage with pepper-spray, or booby-trapping areas the birds like to gather with a substance called Hot Foot, which functions in a manner similar to a glue board but which allows the bird to escape. Encourage natural predators. Adopt several large cats, if you can. They will help keep the birds away, though they may bring you any they are able to catch as a token of affection. 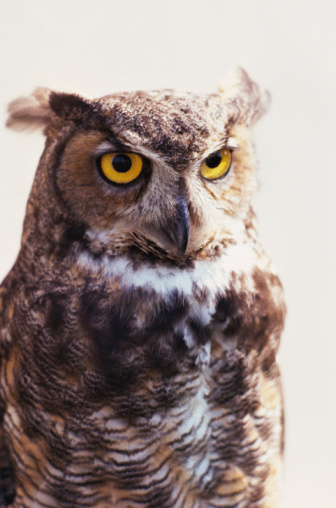 If you cannot adopt live animals, then purchase a few pretenders -- plastic owls, rubber snakes, synthetic hawks -- and place them around your property, particularly in areas that might seem like good nesting sites. 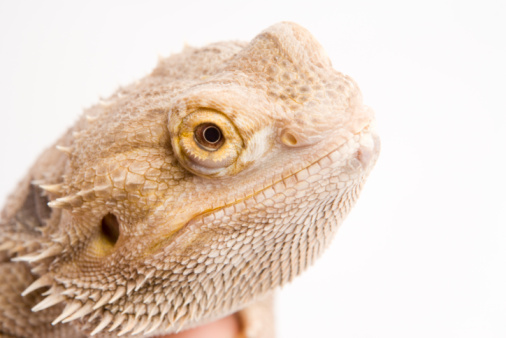 Artificial predators that are motion-activated tend to have the greatest effect. Set up a mynah trap. Contact your local extension office and ask them to bring a mynah trap to your property. Be sure they instruct you as to the proper use of the trap and the appropriate baits to use. Traps should be situated as far away from possible disturbances as possible and the bait should be the only available food source in the immediate area. Once the birds have been trapped, they can be collected and humanely disposed of by a qualified professional.